The cement walled main spring and swimming area is just a small part of the 8,000 acre Wekiva Springs State Park in northwest Orange County, just west of the Seminole County border. There are miles of trails through all kind of terrain for hiking, biking, and horseback riding. 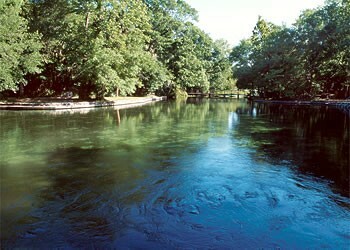 48 million gallons of water pour daily into the Wekiva River from this spring and Rock Springs. A beautiful park and popular swimming area.